Enter personalized birthstone and/or letter here. If you chose to purchase the necklace without a birthstone or letter you can put "none" here. 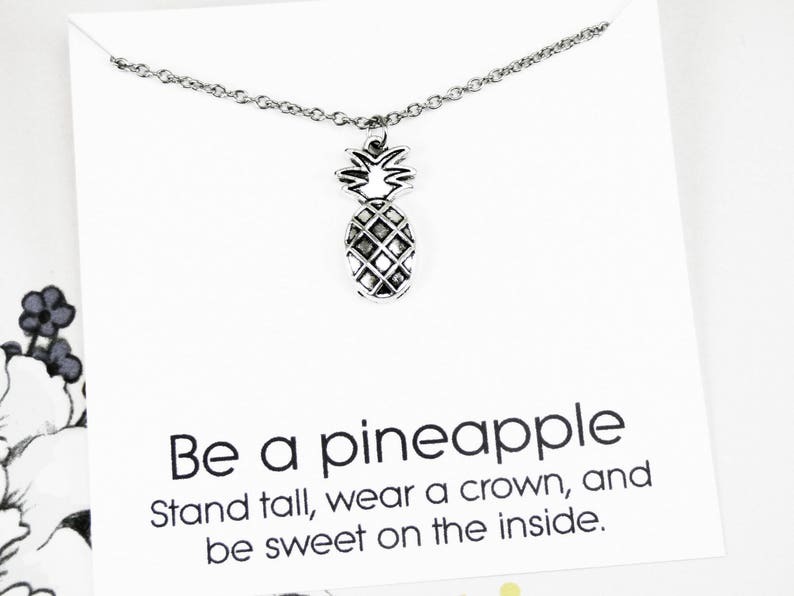 This pineapple necklace is fun and festive. It is a reminder to stand tall and be confident, but don't stop being sweet. Whether as a gift for someone special or to keep for yourself this message card necklace is made to inspire. This lovely necklace is packaged on an inspirational card and set in a 3.5 inch kraft paper jewelry box. I love adding new jewelry so favorite my shop to keep up. Visit my shop for more fun and unique jewelry. I accept Paypal and any other popular credit cards through Etsy. I want every customer to be satisfied! If you are not satisfied for any reason, please contact me before leaving feedback so we can work out the problem. Returns must be made within 7 days of the receipt of your package. The item must be returned in its original condition and unused, or I can not issue a refund. Once I receive the returned item I will refund your money (less shipping). I use USPS First Class mail for all shipping. Shipping within the United States normally takes 3-5 business days. USPS may be delayed during Holidays. I use USPS First Class International shipping for any country outside the US. This does not have a tracking number. Any customs, duties, taxes or fees charged upon arrival are your responsibility and are not reflected in my shipping charges. Shipping times for international orders may vary. Items will be shipped in a bubble-craft envelope. I seek to provide you with the best experience possible. Please contact me if you have any problems or if you would like any more information.